When it’s not possible to remove SQL statements that are unnecessary and the rate of change of common data is relatively low, caching SQL results can provide a significant performance boost to your application and enable additional scalability of your database server. As you can see, the second query performs significantly less work. 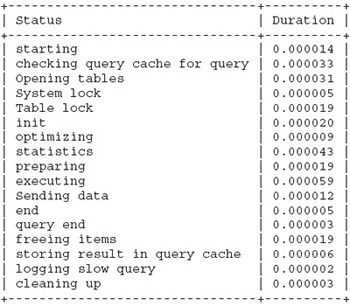 The impact of the MySQL query cache can degrade the performance for environments with heavy write to read ratios. This is due to the coarse nature of the query cache, where a change of any data to a given table will result in an invalidation of all SQL statements that are cached that use the table. In an environment with a high number of reads and writes, this can result in significant invalidations of SELECT statements that do not gain the benefit of ever being used. Alternatively, you could enable a time-to-live (TTL) value for cached values if your caching system allows periodic cache invalidation. The popular Memcached product (refer to http://memcached.org/) is widely used for many applications. This caching infrastructure can be easily integrated with many popular programming languages. There are different ways to implement a MySQL/Memcached data synchronization for invalidation. One implementation is with an integration of the MySQL User Defined Functions (UDFs) for Memcached combined with database triggers to manage invalidations. Another option is to process the MySQL binary log events for SQL statements and then appropriately manage the synchronization with the implementing cache infrastructure.